Development of Chinchorro mummification practices coincided with a population boom, researchers say. A relatively wet climatic period may have triggered the development 7000 years ago of complex culture in hunter-gatherer communities in the Atacama Desert, including the earliest known examples of ritual mummification. 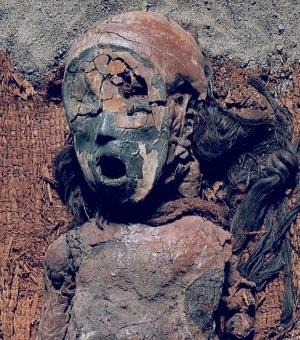 Bands of hunter-gatherers lived along the Atacama coastline from 11000 BC to 500 BC, but the Chinchorro began mummifying their dead only around 5000 BC. An early Archaic burial (dated 9000-8000 BC) that uses similar funerary symbols to the later mummy burials suggests that mummification was a local development, rather than being introduced from elsewhere. Now, researchers posit that cultural innovations, including the cult of mummification, were spurred by environmental change1. Regional climate records for the time, based on the periodic appearance of certain plants in the rock records, indicate that there was a period of greater rainfall across the Andes above the Atacama between 5800 BC and 4700 BC, which would have charged groundwater reserves in the usually dry desert of northern Chile and southern Peru. Springs would have begun discharging water and creeks would have filled. The Chinchorro, who lived in fishing settlements along the coast, would have flourished under these relatively benign conditions, the researchers believe. By combining 460 dates from 131 archaeological sites in the Atacama with existing data on how hunter-gather populations fluctuated elsewhere, the researchers developed a model which indicates that the Chinchorro experienced a hike in population density between 5000–3000 BC. “Environmental change acted as a positive and creative force in the building up of social complexity, instead of being associated with the collapse of society, as is usually emphasized,” says Pablo Marquet, an ecologist at the Pontifical Catholic University of Chile in Santiago, and a co-author of the study. 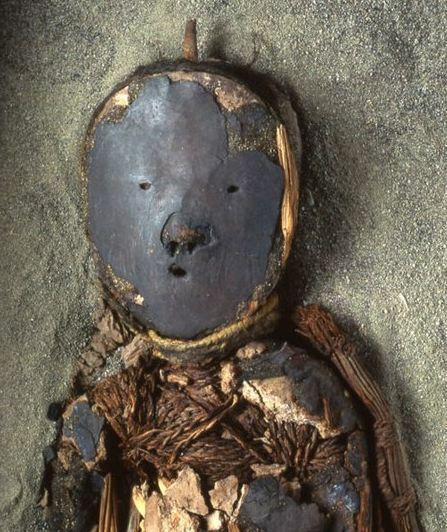 Ritualistic mummification by the Chinchorro, thought to be the world's earliest examples, may have evolved as a result of the population increase, the researchers say. “Dead corpses do not decompose in the coastal desert, so an increase in population size means an increase in corpses that become naturally mummified because of the extremely dry environment,” Marquet says. As the population increased, it would have become increasingly likely that the living would come across a mummified corpse, he says. The work builds on the theory that population increase drives technological innovation — the Chinchorro's complicated mummification procedures are a form of ritualistic technology, the researchers say. The Chinchorro developed various elaborate mummification styles, including painting the skin with red ochre or black manganese as well as disassembling the body. Such complex rituals indicate a complex society, and the period coincided with innovations in fishing tools. Around 4,400 years ago, the practice disappeared from the region. A flurry of warm El Niño currents decreased marine food sources, which is thought to have caused the eventual Chinchorro decline. Marquet suggests that as the population dropped, mummification skills were lost in the wake. Marquet, P. A. et al. Proc. Natl Acad. Sci. USA http://www.pnas.org/cgi/doi/10.1073/pnas.1116724109 (2012).